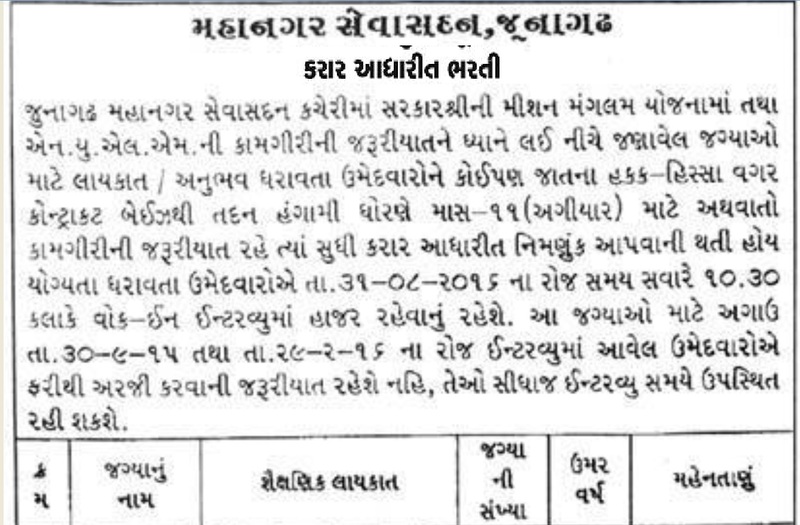 Junagadh Municipal Corporation has published Advertisement for below mentioned Posts 2016. Other details like age limit, educational qualification, selection process, application fee and how to apply are given below. Qualification : Min. Second Class in M.S.W. / M.A., Post graduation in Sociology / M.B.A. / M.R.S./ Equivalent Course from recognized university. Qualification : Any Graduate from recognized university. Address to sent Applications : Office of Commissioner, Mahanagar Seva Sadan, Azad Chowk, Junagadh. Last Date : 31-08-2016 at 10:30 a.m.